It’s the time of the year for goodwill and to be merry. I’m not quite sure what that involves. Perhaps to fill the cup of merriment, you’re drink of choice is a six hour winter training ride through wind, rain and sleet. Or perhaps it involves going to Poundland and getting a Santa outfit for £1 to distribute loads of crap presents you’ve just brought for a pound. (no offence Dad, I do like all those presents from the Poundshop, especially the novelty Santa Hat which makes a good ear warmer on a cold day. Or, perhaps we could jump on the interminable-end-of-the-year-fill-a-newspaper-with-award-ceremonies. 1. 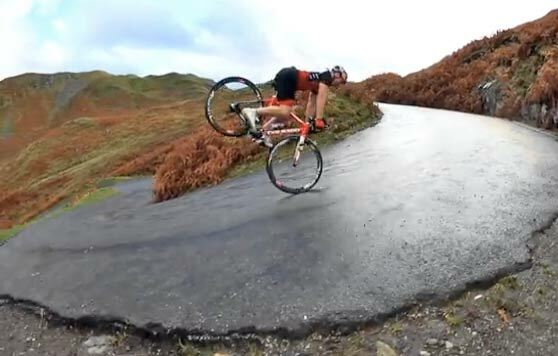 How to descend like a girl and still win the Tour of Britain – Bradley Wiggins. Every cyclist can have bad moments descending, but not every cyclists can time trial like Bradley Wiggins. 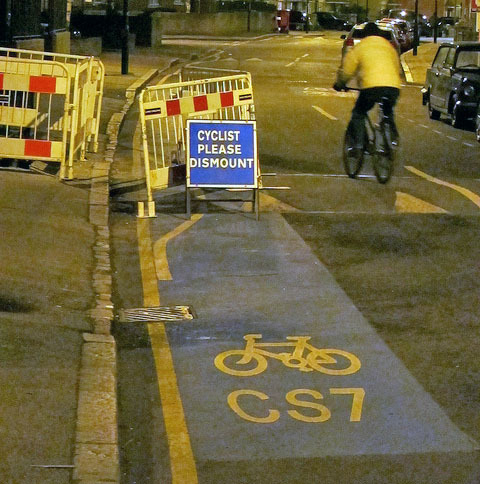 – London’s Blue painted cycle superhighway. Admirably fulfilling the criteria for modern art – cheap, gaudy and without any point. 3. Moral leader of our time. No not Nelson Mandela, instead I’d like to nominate Hein Verbruggen for services to humanity, in pointing out Lance Armstrong is a really bad lad, and if anyone injected EPO into Lance, it really wasn’t good old upstanding Hein. 4. Descending backwards down a 25% hairpin pass whilst doing a wheeley. 5. Peace and reconciliation award. No not Nelson Mandela. But, Bradley Wiggins and Chris Froome for burying the hatchet and showing the real meaning of teamwork, especially at the World road race championship in September. 6. TV calamity of the year – British Men’s road race world championships. Who can forget the day when we all eagerly sat down to watch two hours of cycling on prime time BBC TV – expecting to see the British men challenge for the world championship, who would have thought it 20 years ago? – But only to see the bemused TV presenters trying to work out how they could break the news that the entire British team had already retired by the time the coverage had started. Can you imagine watching another sport – say like cricket and finding out England were already all out by the time you turn on the radio in the morning? 7. Race of the year. Paris-Roubaix. It was the first time I’d seen a live edition of Paris-Roubaix, and I have to say I was transfixed. It was really exciting seeing Fabian Cancellara come through the third group on the road to win. Though I never knew that spectators played such an important role in knocking off random riders close to the finish. Perhaps the 5,000 metres track running championship could be made more entertaining, if the runners had to go around a course on Oxford Circus. 9. Knowing when to quit Pat McQuaid definitely showed a stoicism and persistence in standing for election of UCI president after a glorious 8 years of peace and progress. Just tell him that when standing for election, it’s usually preferable to have some popular support. 10. Cyclist of the year. A serious one for a change. I think Chris Froome deserves it. Someone had to take the heat, cynicism or the Armstrong / doping legacy. I doubt many would have had the patience of Froome in dealing with the never-ending doping questions and speculations. Have a nice Christmas Tejvan and happy new year, but just to say, item 6, you could, turn on the radio and find the England cricket team all out. Thanks Tejvan for a wonderful year of excellent Blogging. The first thing I look forward to of an evening is switching the PC on and reading your latest newsletter and reviews. I hope you will continue in 2014. Have a Merry Christmas and a Happy New Year but watch those mince pies.